Do you have a favorite white cake recipe? Your cake looks really fluffy and yummy! Thanks! STILL my most favoritest 27th birthday cake!!!! Nancy, has your email or facebook account been compromised? I’ve gotten an email stating it’s from you asking for $2000 because you are on vacation in England and have been mugged. Yes ~ it was my FB. Sorry Heather!!! I made something like this in a baking class recently, and it was great! Your daughter is a smart girl for choosing a strawberry cake for her birthday! Um, yeah…I’d eat that for breakfast. Wow! 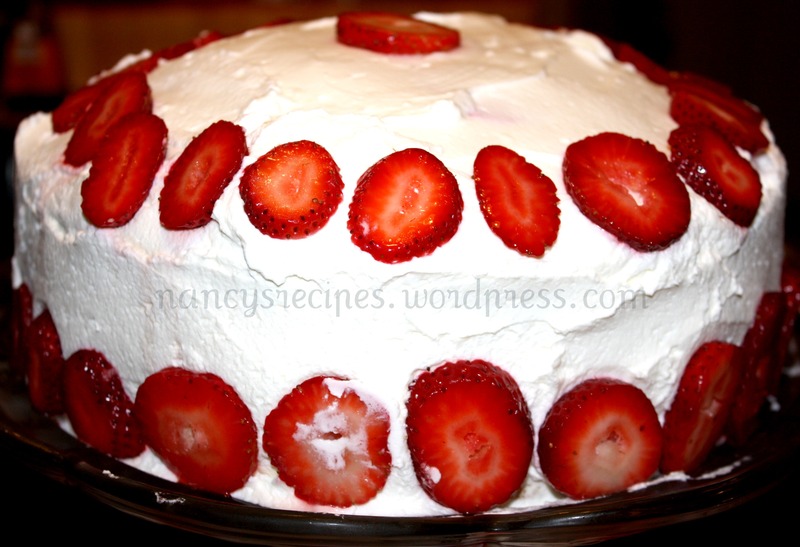 What a pretty cake – I love that you used fresh strawberries. Your frosting sounds heavenly. Um, serious wow. I love strawberry cake and this just looks amazing. Cream cheese and cream. Fabulous. It is really, really good ~ try it!